It's a pretty simple concept, pick a design that you think will look incredible, place custom text on it if you would like, choose a light color, and then buy it! If there is anything you are unsure of please contact us to let us know, we can guide you through the whole process. You can always choose from our stock pictures in our shop. If you are feeling more adventurous then you can send us your own company logo, favorite team, or phrase for a custom plaque. We also have a great wedding line which look beautiful stationed around the reception hall. Whatever your need, there is a plaque that you will fall in love with. Plaques stand 12 3/4 inches tall and 11 ½ inches wide and is made of a strong acrylic. 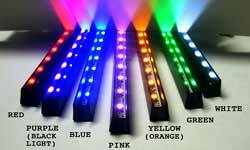 Each plaque comes with an LED light with a color of your choice and can be customized to fit your need. Get more details here.